You are at:Home»Herbs»Carthamus tinctorius Linn. Latin name : Carthamus tinctorius Linn. Description : It is known as Fake Saffron because it has been used as a less expensive alternative to Saffron (Crocus sativus), and also because they have similar properties. The seeds are abortifacient, alterative, analgesic, anodyne, antiaging, antibacterial, antihydrotic, antiinflammatory, antioxidant, antitumor, aphrodisiac, bitter, cardiac, carminative, diaphoretic, diuretic, emmenagogue, expectorant, febrifuge, hypocholesterolemic, immunostimulant, purgative, sedative, stimulant, tonic and vermifuge. Charaka, the famous Indian Vaid, gave the seeds for calculus, gravel and dysuria. Useful as an astringent in dysmenorrhoea. Stimulates menstruation and gives relief to abdominal pain. It is also used to firm up the uterus after childbirth. Also useful in sexual and seminal debility, cough, asthma and colic. Tends to lower cholesterol levels, making it useful in preventing heart diseases. The claim has also been made that safflower flowers prevent coronary artery disease because they are a digestive bitter and assist in the digestion of oils. Infusions of safflower flowers are used to lower the accumulation of lactic acid in the muscles during athletic competition. In addition, a compound has been isolated from safflower that stimulates the immune system in mice. Additional studies are ongoing to confirm this effect. Also used in weight loss as a fat burner. 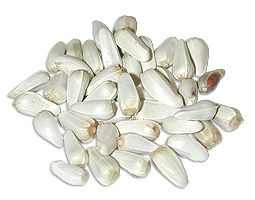 More recently, safflower has been identified as the source of several flavonoids with strong antioxidative activity. Recommended Dosage : Seeds : 2 to 4 g powder; Flowers : 3 to 5 g powder. Contraindication : This herb is contraindicated during pregnancy.